Elegant hillside ranch w/panoramic views! Provides perfect, one-level living. Kitchen glows w/warmth & welcome w/custom cherry cabinetry & Corian countertops. Lots of work space for more than one cook! Natural light floods every room. Well-planned layout. Beautiful bathrooms w/high end finishes. Trey ceilings, custom built-ins, gas fireplaces, & two surround sound systems. Excellent flow makes this home the perfect place to entertain on a large scale but cozy enough for an intimate group of friends. Enjoy the views from kitchen, great room, master, lower level family room, upper deck and lower patio. Walk out. Huge lower level workshop. 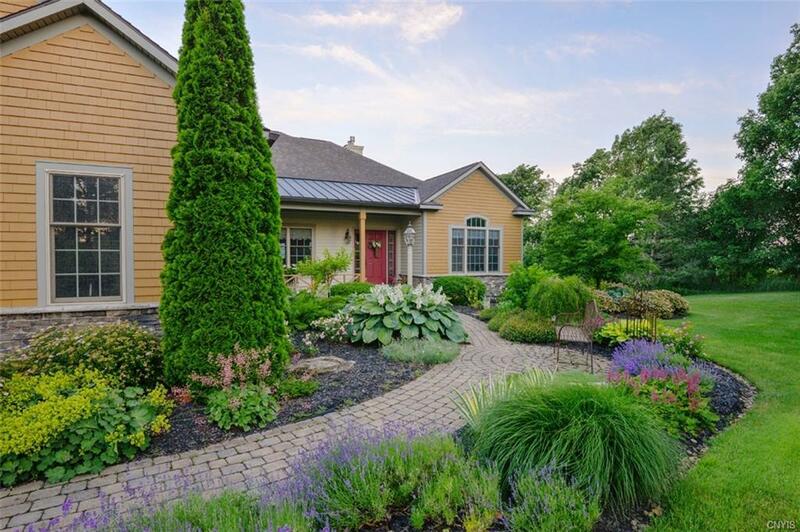 Tasteful, low maintenance landscaping surrounds the house on a quiet cul-de-sac in award-winning Cazenovia School District. Move in and live your life!